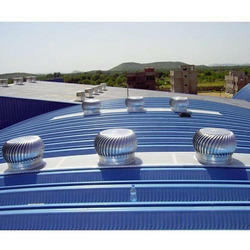 Prominent & Leading Manufacturer from New Delhi, we offer air ventilator and turbo ventilator. We are engaged in offering Air Ventilator. 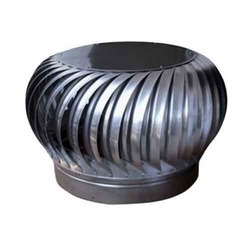 Features: Adopt pressing shell for motor with fine heat dispersing effect. Low noise ball bearing, reset heat protection, long service life motor. Adopt superior light steel sheet pressing structural components with fine rigidity, light weight, good appearance and convenient installation. Turbo ventilators utilize wind energy to create airflow by centrifugal action. A centrifugal force is created by rotating vanes which in turn creates the low-pressure zone which then draws in fresh air from outside and throws out hot & polluted air from inside the shed. Such a continuous cycle creates air ventilation. Continuously circulates fresh ambient air inside the shed. Removes trapped hot air, gas fumes, smoke, and stale air. Assures 24/7 free of cost ventilation. No operating and maintenance cost. Reduces temperature, humidity, and suffocation. Economical & 100% power saving. Stainless steel and Aluminum Grade.